I'm Ken from the Boston Massachusetts area. I'm Legally Blind due to a congenital condition known as Ocular Albinism with Nystagmus, and one who lives with Type 1 Diabetes. Neither of these issues interferes with my ability to accomplish (nearly) any goal that I set out to tackle. I do face difficulties and roadblocks (who doesn't), but I either push right through them, work around them, or just accept them and do the best that I can. My greatest passions are creating computer graphical artworks (for web, applications, and personal use), working on my websites, volunteering for the Mozilla Foundation, and as cheesy at it may sound, making people smile. The following lists some of my current projects as well as some of my past efforts. Most are in the process of being updated. Access Firefox is a site / project that I created to provide Firefox end users with visual impairments, those without perfect visual acuity, and individuals with certain cognitive disabilities, Firefox accessibility related tools and resources. 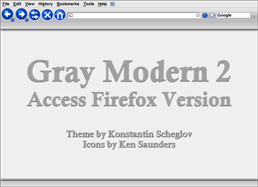 The site's content primarily consists of information about the default accessibility options and tools within Firefox, brief guides about some of the Firefox Add-ons that can be used to make viewing and interacting with the Internet easier, more comfortable, and efficient, and a good amount of introductory material about using Firefox itself. Access Firefox is an ongoing project that was built by, and is maintained by volunteers from within several different Mozilla communities. The Page Zoom Button add-on allows users to control the full page zoom feature in Firefox from a single toolbar button. Sharp, colorful, and easy to see, large (48x48 pixel) and extra large (64x64 pixel) Firefox toolbar buttons. Get Big Buttons from the Firefox Add-ons site. 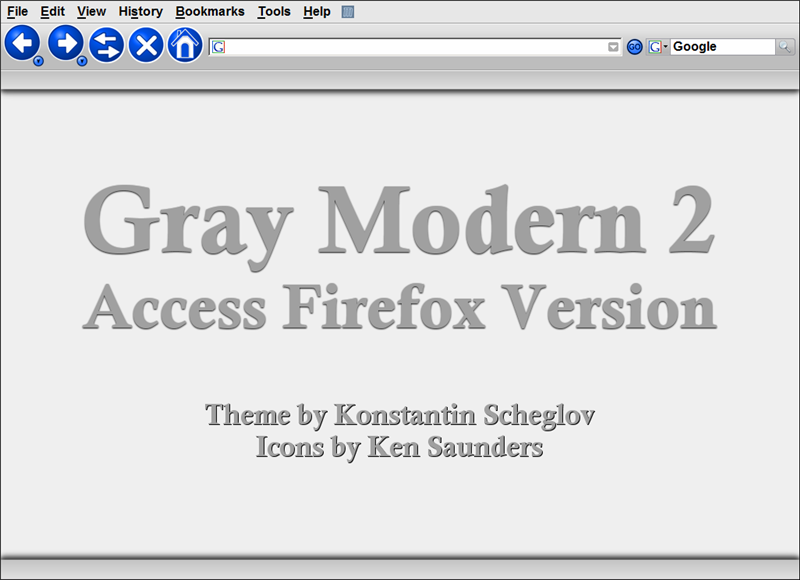 Allows users to change the global font and font size for Firefox itself meaning for all windows, menus, toolbars, etc. Also available for Mozilla Thunderbird and SeaMonkey. Toolbar button with a drop down menu containing the native Firefox Web Developer tools for quicker access. Note: The functionality of this add-on is now a default feature in Firefox (Add-ons toolbar button). Toolbar button to launch the Add-ons Manager. Button opens the Add-ons Manager in a new tab and can be placed on any toolbar including the Add-on Bar. Here are 2 Firefox themes that I created icons for. Also compatible with Mozilla Thunderbird. As I mentioned at the top of the page, I have a great interest in computer generated art. I've been a member of deviantART.com since September 2005, and in that time I have submitted over 150 different pieces of my artworks that have been individually viewed more than 927,000 times which still amazes and humbles me. 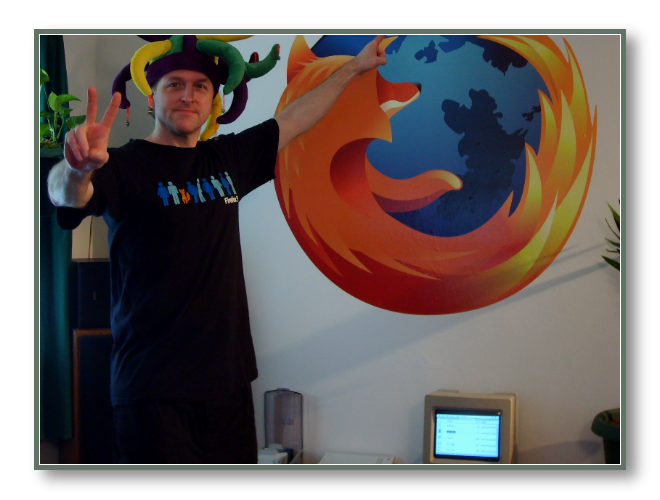 I was a member of Spread Firefox (the first official Firefox marketing site) for 6+ years. I was selected for the Volunteer Spotlight on 10/14/2006 and became an administrator on 12/08/2006. I loved SFx. I spent the majority of my time there and met some great people with whom I'm still friends with. Some of them close friends. As an administrator, I helped launch Spread Thunderbird in November 2008. I also helped to moderate the site, interact with and help out and guide other members and Thunderbird users, and I made many content contributions. Former Answers.com category supervisor for Mozilla Firefox and Mozilla Thunderbird. Answers.com is an excellent organization to volunteer for. For the web site Squidoo.com, I created a Firefox Guide (Lens) that made it to the #7 spot out of tens of thousands of Lenses. The Firefox Guide was number #1 in Computers and Technology, and it was also selected as Lens of the Day in April of 2006. I'll be updating the guide to reflect the newer Firefox features as well as the other content there. The main purpose of this page is to hopefully inspire others who are also facing challenges and to show them that persons with different abilities can reach their goals and a measure of success (whatever that may be to them) even when they may face seemingly insurmountable barriers. A person is considered Legally Blind, in the USA, when their visual acuity is 20/200 or less in their better eye with best correction. Ocular Albinism is an inherited condition in which the eyes lack melanin pigment. Nystagmus is an involuntary back-and-forth movement of the eyes. Diabetes is a disease in which the body does not produce or properly use insulin, a hormone that is necessary to convert sugar, starches, and other food into energy.